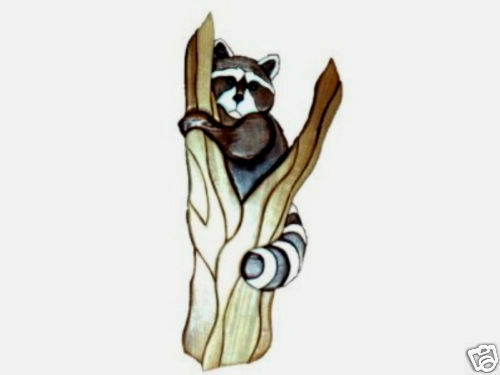 "Carved Wood RACCOON IN TREE Wall Hanging" "Raccoon In Tree"-Intarsia wood carving, made by hand in Wisconsin of native grown oak. Individual pieces are cut, shaped, sanded, stained, and then glued onto a plywood backing. Natural graining of the wood makes each item unique. Measures approximately 10" wide x 20" high, and comes ready to hang on your wall. PLEASE NOTE: Shipping ONLY within the continental U.S. Hawaii, Alaska, and Puerto Rico residents please contact seller for shipping quote before ordering.